The Dean, Faculty of Education, University of Ilorin, Prof. Solomon Adekunle Olorundare, has commended President Goodluck Jonathan on the disbursement of N200 billion revitalisation fund to public universities in the country. 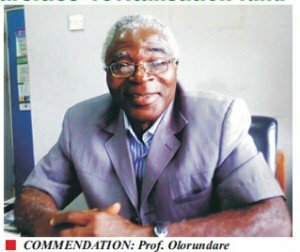 Prof. Olorundare, who gave the commendation in an interview with Unilorin Bulletin last Tuesday (February 18, 2014), noted that the revitalisation fund would bring a lot of improvement to the infrastructure of Federal and State Universities across the country. The Federal Government, last Monday (February 17, 2014), disbursed the funds to Vice Chancellors of public universities in line with the recent agreement between it and the Academic Staff Union of Universities (ASUU). Prof. Olorundare pointed out that the government has the overall responsibility to ensure accountability by monitoring the utilisation of funds in the tertiary education sector. He, however, stressed the need to urgently address the lower levels of primary and secondary education, especially in the area of science, in order to promote the overall quality of education in the country.